There is a better, more efficient way. Most turret presses include an auto-index station that rotates a punch and die to any designated angle dictated by the machine program. Mate offers a wide range of special shapes that can be used in the auto index station to improve manufacturing efficiency and product quality. This Solutions Bulletin looks at three high value shapes: Quad Radius, Inside/Outside Radius and Banana Tool. Using a punch and die with an arc for a much larger circle, your auto index station can create a smooth edged, round hole limited only by your sheet size. 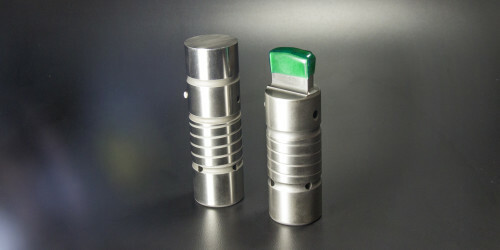 The Quad Radius tool (right) produces large holes with smoother edges and with far fewer hits than using a round nibbling punch. In effect, the Quad Radius tool puts an 8, 12, 16 and 20-inch punch into a single 2-inch station. It will create even larger holes, but as hole size exceeds a tool radius, scalloping begins to appear. Fully Guided tooling is recommended because the positive guiding action gives the punch the support it needs for nibbling and the stripper clamps the sheet securely to prevent lateral movement. You can order any custom radius you wish. This Inside/Outside Radius tool is for use in Auto Index Stations. The inside radius must be larger than outside radius. This tool can be programmed to punch holes with slugs or parts retained in the sheet, yet can be separated easily off the press. The tool’s large radii result in slugs with smoother edges, produced with far fewer hits than using an ordinary radius punch for nibbling holes. This one tool punches slugs of any size practical for its configuration. The smoothest edges occur when the radius punched and tool radius coincide. With an Inside/Outside Radius tool, you do not have to stop the machine to remove the slug for an oversize opening, or remove the blank if saving the slug. By using small, precise tabs, the machine does not need to be stopped to remove a slug for an oversize hole. The precise tab is created by leaving a .015”(0.40mm) gap between hits. Once the sheet is removed from the machine, you can still break away the tabs and slugs. Similar to Inside/Outside Radius tool, Banana Tools allow fabricators to use the inner part to nest smaller parts. “Obround” banana tools may be more effective in thicker material because, unlike the inside/outside radius tool, there is no sharp point that could break.